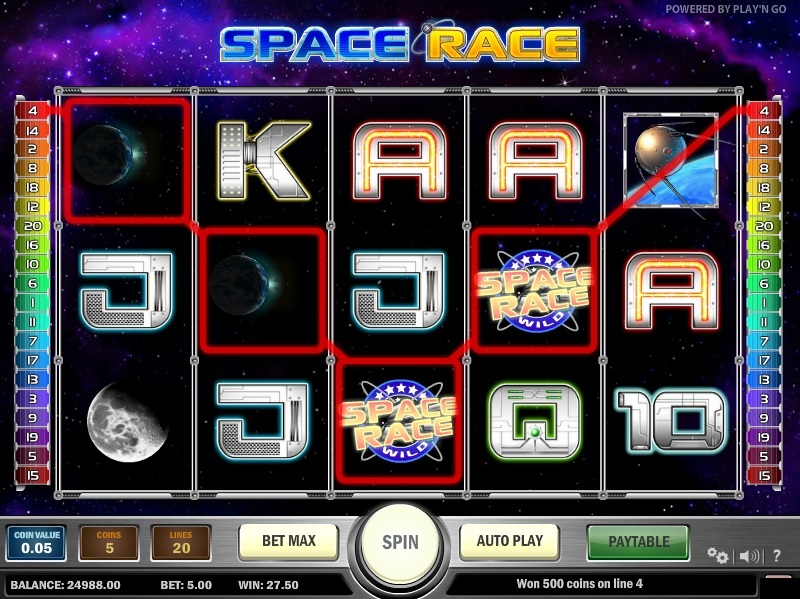 Space Race is a charming space-themed online video slot designed by PlayNGo. Players will be delighted with its charming graphics, audio effects, and bonus features such as free spins, scatter wins, and a bonus game. Space Race is played the same way other slots are played. Players need to select number of paylines and place their bets before hitting the Spin button. They can adjust number of coins and lines by clicking on the lines and coins options. The next step is to select a coin value from a range of $0.01 to $0.25. If players are daring enough, they can bet maximum by hitting the Bet Max option. The slot allows players to bet as little as $0.01 to as much as $25.00 per spin of the reels. The slot comes with an Autoplay feature, which players can use to spin the reels automatically. Players can also customize their gambling experience by altering the game settings as they wish. PlayNGo’s Space Race is based on the space theme, owing to which its reels are set in the backdrop of space. The reels are populated with bright icons of high-value card symbols along with symbols of spaceships, meteors, astronauts, satellites, moon, earth, and so on. Space race is an excellent slot for players who are fascinated with outer space. The starry Space Race Logo symbol serves as the wild, helping players complete winning combinations by substituting for all other symbols except the Free Spin, Bonus, and Scatter symbols. If players land five Space Race Logo symbols along an active line, they will win the top fixed jackpot of 5,000 coins. The Meteor Shower symbol serves as the scatter, owing to which players do not have to land them along an active line to win payouts. Players will receive payouts of 300 coins, 30 coins, 3 coins, and 2 coins for spinning combinations of five, four, three, and two scatter symbols, respectively, anywhere across the reels. The Meteor Shower Warning symbol helps players activate the free spins bonus round. For this, players need to land at least three Meteor Shower Warning symbols, which act as wilds during the free spins round. The free spins bonus cannot be re-activated during a free game. If players land at least three Satellite bonus symbols across the reels, the bonus game gets activated. This is a multi-level bonus game, which challenges players to go to the moon. Players can win up to 1000 coins in this feature. Space Wars is a charming game for players to enjoy. In addition to the top jackpot of 2000 coins, players can win up to 300 coins in scatter payouts, 1000 coins in the bonus game, and much more in the free spins feature.